Since I went to Davao a couple of days ago, I felt it was but right to give time and relative attention to one of the few places I visited while staying there. Honestly, when I was looking for a food adventure in Davao I was gearing more into none of those fine dining shops because I've heard they've got pretty much a hefty amount of places to go to in this city. I wanted something like a hole in the wall thingy where everyone is enjoying food without breaking the bank or just simply one where locals would actually frequent to. With the recommendation of D60Krew matriarch and new local Davao resident Ms. Bambit Gaerlan we went to a nice quaint place over at Central Quirino (Elpidio Quirino Avenue). It's a few minutes via a cab ride away from where I stayed in Davao. This was officially the time we're meeting each other (after a long time); the last time of which she was still in Pasay City. We agreed to meet dinner time so I could get to roam around the place in the evening and get a few hours rest from roaming around the city the whole day. The place had a no frills, no thrills kind of ambiance. I think they were really gunning for that backyard kind of feel so everything was out there in the open. The tables were a little greasy so I'm kinda expecting this to be a little adventurous. Lo and behold they've got pretty good ones in the menu! Jalapeno Poppers - It's a lot like stuffed Jalapeno Peppers most Mexican/Spanish restaurants served stuffed with cheese and other things but this one's a little chopped/grounded up, quite creamy and probably had potatoes/starch into it instead of ground beef. The Jalapeno of course is HOT just the way I like it. I wanted to see what they have in store for me that evening. The friendly crew got us to choose how we wanted our burgers to be cooked. A chart explained how we'll be having our meat served =) now this is one thing I love already, I always have my steak medium rare and that's what I got! I said OH! and took a closer look. Actually, this thing kinda looked familiar to me even if I didn't visit the store yet, it felt like de javu!.. this probably was in my dream! This is their BB Garhsroom Burger - It's got lettuce, tomatoes, ketchup, mayo, onions, cheddar cheese, their own home made burger patty (which I heard is Australian in descent), garlic mushroom smothered in melted butter, bacon and a black sesame seed bun. Photos don't really lie. It looks good, it tasted good. This only costs a mere 130.00 bucks! 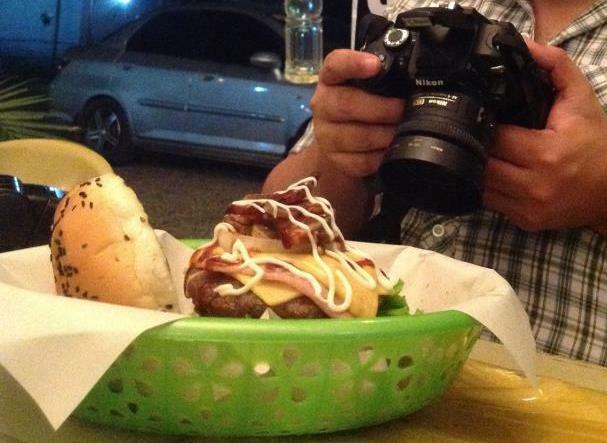 It's a gourmet burger but not priced as one like those heavy ones you see in the malls. I observed they had margarine/butter also on the bun which made the burger a little tasty. Though patrons might think this will overwhelm the burger, it was actually just right for me. Not for the faint of heart though because you might understand this is comfort food. Don't expect tofu on your burger here! Good food, fair price, its a treat to have this be my dinner of all places "Davao!". Man, it was heavy that I couldn't take a bit off of it because it was HUGE! I thought all I would see here was seafood and small treats on corner lots but this one was good! I wouldn't mind having my comfort food fix in Backyard Burgers. So if you guys want to visit Davao real soon, you better make sure you got this on your list! /*Disclaimer: I paid for what we ate! c^^,) my vacation, my treat! kagutom! iba ang dating sa akin ng BB Garhsroom Burger, parang soul mate ko sya. kailangan naming magkita!